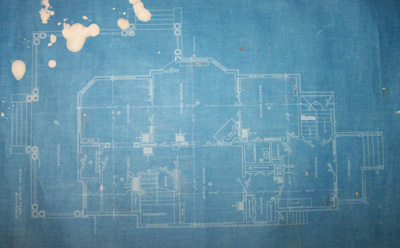 When purchasing the house, we also were presented with some extensive documentation of our house's history. In fact, we have the original construction contract, floor plans,architectural sketches and a deed from the original owner. We also have a book written by the first owner of the house titled "John Porter and his Descendants". However, nothing is more gratifying than the items we found in the walls and floors during our remodeling. 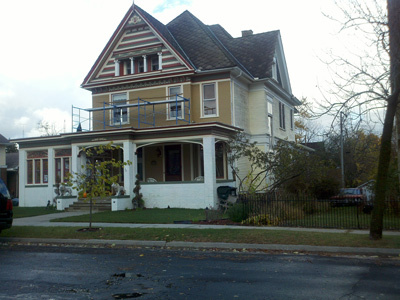 Our house was built in 1904 by Arthur Amasa Porter. He taught school for ten years, served as a Columbia County Register of Deeds, Portage Postmaster, and the editor and publisher of the Portage Daily Register which was a Republican Newspaper at the time. The Register which he later bought and incorporated it under a new name of the Wisconsin State Register. From what we have discovered, he was a prominent figure in Portage. 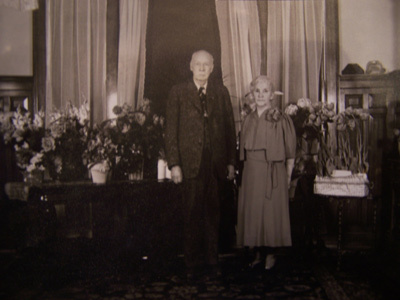 He was good friends with Governor Robert M. La Follette, SR. and also owned a few properties in the downtown and outlying areas. 50th Anniversary Picture in the Dining Room. The house was designed by F.L. 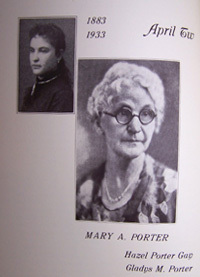 Lindsay of Watertown for A.A and Mary Porter. 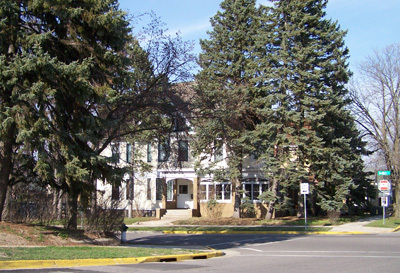 The house was listed on the National Register of HIstorical Properties in January 1997. 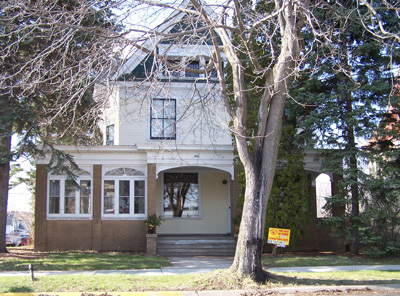 The style of the house is registered as a Queen Anne, but we have heard it called a 2-story Folk Victorian, late Victorian, and a cross gabled Victorian. Whatever style people have called it in the past, we want to eventually evolve it into a "Painted Lady" with all the eastlake style gingerbread and polychrome colors. 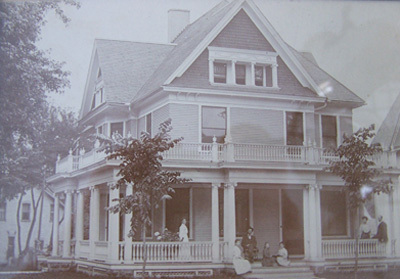 The house featured a steep pitched, gabled roof, a large surrounding porch area supported by 21 wooden columns, balustrades on top of the porch. The inset windows in the roof gables are also fronted by classical columns. 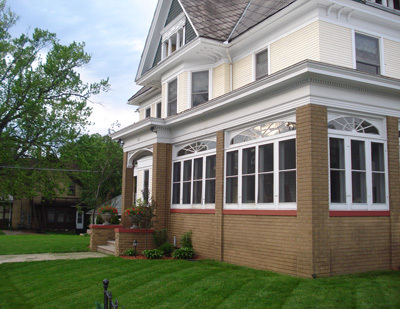 In the 1930s the front porch was replaced with a brick, partially enclosing the porch. The Porters continued to live in the house until 1977, when the house was purchased by the second owners, who sold it to us in June 2006. We are the third owners of this property. 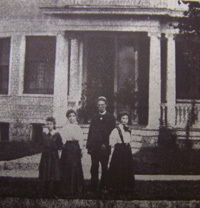 Porter family in front of the house. Below is the transformation of the house throughout the last century. We don't know the exact date of this photo, but we think it was taken very shortly after the house was built. June 2006, days before the purchase. Tough to see the beauty behind all those trees. with the details of all the work we have done. We found many items while remodeling, some very old and some that tell stories. Many odd items between the floor boards and in the walls. What good would the carpentry be if the workers didn't have a couple beers? 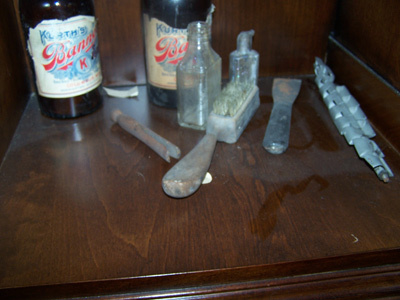 The small bottles we believe were 1910-1930. 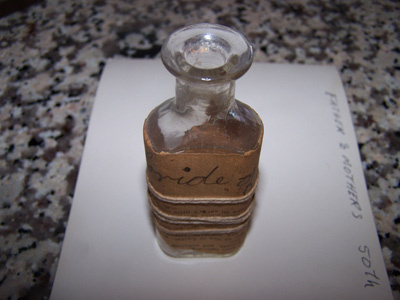 Here is an empty bottle of "Chloride of Gold". Too bad it wasn't full of just gold! Here is a letter we found to Esther Robertson July 18, 1915. The letter is from a "Bud?" R. Nelson from Lodi, Wisconsin. From what we read and can speculate....she was "installed" at the Porter Family Home and not sure if she was the maid or just a family friend. He does ask if she will be paid for staying at the Porter Home. He talks about the rest of his family going to the "Chaulaqua?" (Which we think is the Chatauqua) and spending time at Devils Lake (Devils lake State Park). He tells her she always looks "CHIC" in what she wears and signed it "Lovingly Yours". 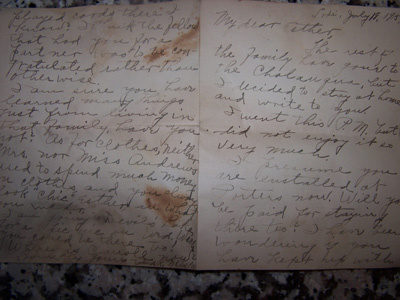 This letter was found it in the rear stairwell, behind the wood door mantel that led to the rear porch. It was obvious that it was hidden on purpose, not to be seen by anyone. 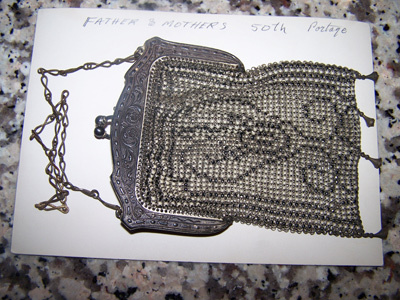 Our most valuable find is this Silver Whiting and Davis Mesh Bag. This was hanging off a radiator valve hidden from view next to a wall. We believe it is from the 40" or 50's and probably belonged to the daughter Gladys Porter. Although worth a couple hundred dollars, we have decided it will remain in our cabinet of "Found Things". 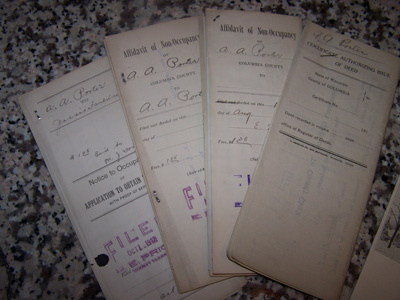 Some tax deeds that came with the house. 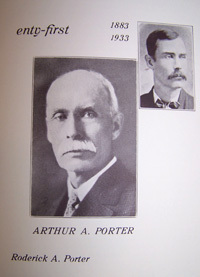 These are from 1910 to 1920 and are the properties that A.A. Porter bought spanning from Poynette, to Downtown Portage. 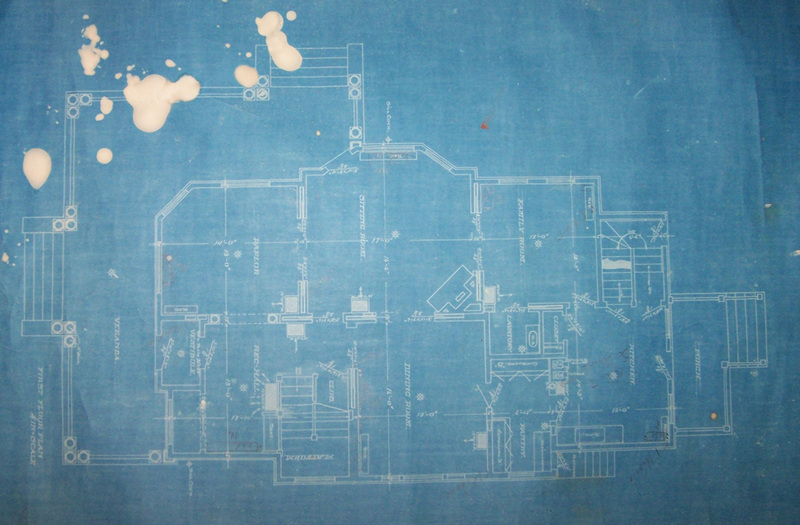 As it turns out, all you need is $19 to buy some land back then..
Below are the original construction drawings of the house. Few changes were made over the years, just mainly the radiator location. The changes include the vestibule being opened to the reception hall, which was probably in the early 30s. We assume that at the same time the two columns supporting the half walls to the parlor were replaced with french double doors. 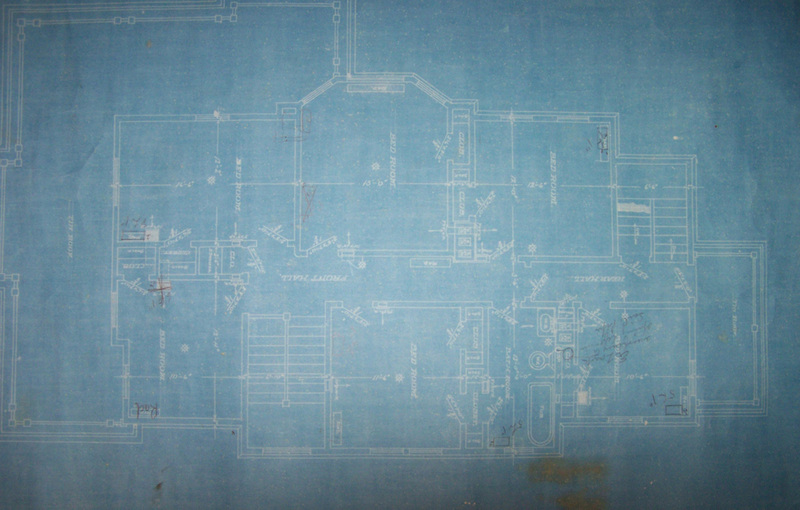 Everything else, reflected on the below plans is what we were faced with when purchasing the home. 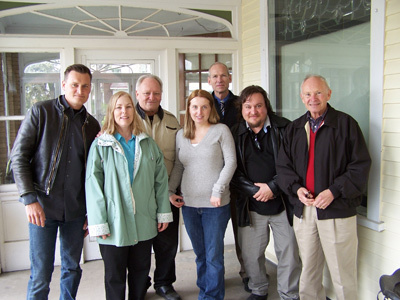 We were glad to have one of the grandsons (pictured on right) of A.A. Porter come for a Visit in May 2009. Here is Marlena with some of his Family. 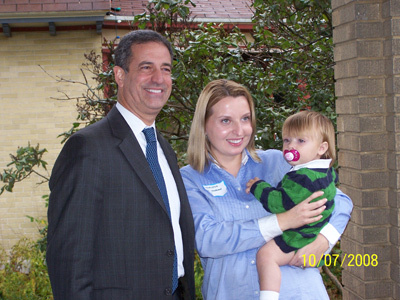 Although A.A. Porter was a well documented Republican political figure in Portage, we had the opportunity to meet a well known Democratic Senator from Wisconsin, Russ Feingold. This is where we will add the new history as it happens.